There are several drills that can be use to help with your transition offense. Before proceeding here, read the page on Transition Offense first. The transition offense and fast break can be broken down into its components when practicing and doing drills. First, to get the break going, you must box-out, get the defensive rebound and the quick outlet pass. Some coaches teach getting the outlet pass to the ball-side wing, while others teach passing the outlet directly to the point guard in the center near the free throw line. Design your drill depending on which method you like. Have two offensive and defensive re-bounders near the basket. If you are teaching the outlet pass to the wing, have a guard on each wing (free-throw line extended). The coach shoots the ball up and the re-bounders fight for position and get the rebound. If the offense gets the ball, they return it to the coach for another shot. Repeat this over and over, to both sides. From time to time, have another player, manager or assistant step into the outlet passing lane, so that the re-bounder learns to look first for his receiver, before blindly making a bad pass. For the center outlet pass, use this same drill, except instead of the wings, just have your point guard in the center above the free throw line. Put a defender on O1 to teach that he/she has to work hard after the rebound to get open and get the pass. In this offensive scheme, the point guard must get the ball. The rebounders, instead of pivoting to the outside wing, are now looking up the middle. Once the point guard gets the ball, he/she pivots and starts the speed dribble up court. After reaching mid-court, the drill is over, and the ball is passed back to the coach. Start the drill with both teams in a half court situation. The coach puts the ball up on the rim and players fight for position and rebound. If the offense gets the rebound, start the drill over. Once the defense rebounds, they should get the outlet and then fill the three lanes, and run the fast break full court, with the trailer and preventer coming last (see Diagram A). If the defense steals or intercepts a pass, have them start their own fast break. If the defense stops the break in the half court (without getting the ball), start the drill over on that end of the floor for the other five players. 1. Make sure the outlet is clean and the pass is not forced. 2. Try to get the ball centered, if possible. 3. Make sure the lanes are filled quickly, and make sure each player knows his/her assignment. 4. The point guard O1 should speed dribble up the middle lane and stop at the free throw line. He/she looks to pass to the wings, or pops the free throw line jumper. If all three lanes are not filled (just two), and O1 has a 2-on-1 situation, he/she can take it to the hoop for the lay-up, or dish off to a teammate. 5. The wings should be looking for the pass from the point, and take it in strong for the lay-up. If the point guard pops the jumper, the wings should crash the boards for the offensive rebound. If neither happens, the wings should cross under the basket and fill the opposite corner-wing area. As they "clear out", the point guard should veer off to the right side of the free throw circle, and the trailer should be coming through for the pass. This all takes timing. If the trailer gets there too soon, the paint will be congested, and if too late, the defense is already in position. 6. If the defense, steals the ball during the break, have them push it back up for their own score. You want to make sure the prevent man is holding back and knows what to do. If the point guard finds a 2-on-1 situation when attacking the hoop, his/her first thought should be to score or get fouled. He/she should attack the hoop at an angle along the lane line (see Diagram below). His/her teammate should be at the opposite low block looking for the pass or rebound. If the defender comes up, or sets to take the charge, pull up and pass to teammate. See this drill. In this situation, there are two defenders back and the offense has the middle and two outside lanes filled. Usually, one defender will stop the ball at the top, and one stays inside down low. The point guard should not penetrate beyond the free-throw line or elbow. He/she should look for the wing slashing toward the hoop and make the pass to the open wing, who then has a 2-on-1 situation with the low defender and should look to score or get fouled as the first option (Diagram A below). Over-passing on the move sometimes results in a turnover and a missed opportunity. If the defender sets to take the charge, dish either to the teammate on the opposite block, or back to the point guard for the easy shot from the elbow (Diagram B). 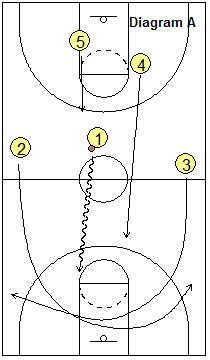 Have three lines corresponding to the three lanes of the fast break, at the half-court line. Have your point guards in the middle lane, and your wings on the outside lanes, in the positions where they usually play in a game. Have one defender in the paint. I would suggest having your players who usually play the "prevent" position as the in-the-paint defender, because this will be a good defensive drill for him/her to stop the break. Have the point guard run the 3-on-1 break. Make sure the offense knows their assignments as pointed out above in points 4 and 5. Once they are proficient at breaking the one man defense, have them go 3-on-2.